Two months ago, I challenged myself (and others) to translate one online conversation,rant or suggestion I had started/participated in/offered into an offline action. This was in a bid to prove to myself, and others that in an era of collaborative economy, we are empowered to do much,much more than just complain, opine or observe. At the time, the rains pounding down on Nairobi made for a tune of traffic complaints, online and offline. Traffic jams were the subject matter of tweets and facebook updates. Overlappers earned their place on many a twitpic and the #TwitterBigStick was virtually caning many a driver. Yet, with all the content that was being generated online, there was little,if anything to show for recourse. The state of roads,new and old, was one of floods and ensuing flat tyres(thanks to hidden potholes and bumps whose blades were all the more sharpened,to the business benefit of mechanics around town.) Having fallen victim to the mayhem and madness, I posed a rhetoric on what we would have learned once the clouds folded and the rain stopped pouring. But, chanting and ranting has done little to improve the state of the roads on our cities. And it’s against that backdrop that an offline event was organized, that sought to translate online conversations to offline action, as regards Nairobi road safety and traffic. Interested parties, stakeholders and everyone in between was welcomed, and the power of online communication was leveraged to find people with insight,ideas and solutions in the works to alleviate the traffic status quo. After many emails,tweets and phone calls, a speaker line-up of coders,policy makers and volunteers emerged. This Android app built by Kenya Methodist University student, Thomas Kioko ,promises to do a lot as regards sharing on traffic offences, offering users a means to report incidents likely to cause accidents. The app goes a step further to offer first-aid tips, a complaint-filing system by vehicle type/company, vehicle registration number,route number, and a short commentary. One can report accidents by area, intensity(vehicle collision,slight injuries, serious injuries), first-aid tips(for bone injuries, bleeding, unconsciousness etc). A ‘road watch’ feature will allow one to browse lists of blacklisted vehicles, road repairs, traffic news, road signs, rules and regulations,alerting users(telling motorists what’s happening) among other services. You can navi(gate) by stage and routes, set an alert to notify you whenever approaching your destination point(300m away from it). It also offers route information and stage gallery(aerial views). Philip Ogola shared on Kenya Red Cross‘ online crowdsourcing initiative, iVolunteer. Volunteers share information regarding accidents, incidents with the Red Cross via their online platforms(Facebook, Twitter) and in turn, they broadcast the information to their wide following. Red Cross also issue warnings,alerts and safety tips. Through iVolunteer, lives have been saved, offered Philip. Be it responses to calls for blood donation or tracing lone accident victims(as told in this news article). Powered by Ushahidi and monitored by Bankelele and Kahenya, Overlap Kenya crowdsources traffic incidents: reckless driving,traffic police bribery, road abuse by GoK/diplomatic-licensed vehicles,unroadworthy vehicles and of course, the grand Nairobi menace, overlapping. 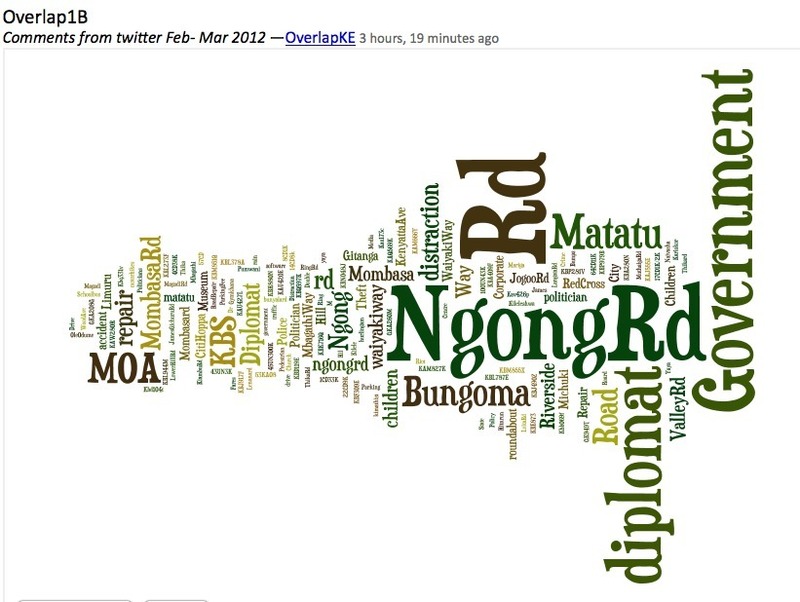 Tweets and twitpics are monitored as uploaded under the #overlapKE and #TwitterBigStick hashtags, and reports generated as shown here. Developed by Laban Okune, Ma3 route ‘let’s you easily get that place you are looking for.’The platform assists in finding the cheapest, most direct, least traffic-congested public bus route available to get you from point A to point B. You can access the info via SMS, web, or android. More about the platform here. And that was that for the ‘tech aspect’ of it. Solutions offered by the tech community, their scaling dependent on collaboration/coordination with relevant authorities. Yet, as it turns out, they have the problem (thought out) all wrong! That was one of the opening remarks by Dr. Eric Aligula of the Kenya Institute for Public Policy Research and Analysis, KIPPRA in his presentation. More on Dr. Aligula’s presentation, the ‘real’ problem and the policy research findings in part 2 of this post series.